Rioja is one of the most prestigious wine regions on this globe. No doubt about it. Luckily Oskar has a great affinity with spanish wines and also collected some nice specimens during the last years. We were all very curious how these old Riojas would come out, especially compared to other „old bottles“ tastings we had like the Burgundies’ for example. I could do a quick profile of Rioja, but why should when the Winedoctor already has done such fine work on it. Our starter-bottle was from the Campo Viejo Bodega on which I don’t have much info except its website. It had a brick-red colour with a brownish rim, high clarity with a few floating particles. The bouquet came sweetish with a berry touch and a slight marmelade impression. On the palate it left a very balanced and round impression with perfectly solved tannins. No signs of 37 years of age except a slight bitter note in the end which punctuated a very nice length. This wine came from a good vintage according to Mr Parker (90 points for the vintage) and was still very nice to drink, nevertheless we believer it has seen better days before. 1975 Imperial Gran Reserva C.V.N.E. Imperial is a brand name from C.V.N.E. (Compania Vinicola del Norte D’Espana) which exists since the 1920’s and has a great reputation for bringing constantly great qualities. The Bodega is known for being a motor of innovation for the Rioja region; it has for example among the first bodegas to bottle its own wine and to build out ageing capacities of its cellar. It had a very brilliant ruby-red robe with slightly brown sides. It had clearly a more intense colour than the first wine. Its nose was intensely perfumed with berries, without permitting us to identify a particular berry (we guessed bramble-berry though). On the palate it was sweet at first, than fruity with a slight eucalyptus freshness. Its length was enormous, most of all 5 wines, but here again a slight bitter note came through. Marques De Riscal is a very well known brand/winery in Rioja, since they also belong to the pioneers in that region. This wine seems to be neither a Gran Reserva, nore a Reserva, thus we believe it is a simple crianza. Nevertheless 1978 is supposed to be one good year in Rioja. It had a ruby red, slightly blunt colour with only a little brown on the side. In the nose some strawberry. On the palate then, it appeared balanced without any adstrigency, yet with a slightly sour touch of red fruits. The final then was average, in particular when comparing it to the last wine. 1982 again a very good vintage for Rioja, delivered to us by this rather unknown bodega (at least to me, and the spanish website didn’t help me much either). But let’s rather describe the wine itself. It had a rather light colour. The nose was full of berries and with time developped and had a nice peppery touch. On the palate, the berries appeared again accompanied by a complex interaction between vanilla and liqorice. It had a nice length with a certain eucalyptus freshness. The slight bitterness was also there; nervertheless this was in our opinion the most enjoyable of the 3 younger bottles. Faustino is a very popular Rioja brand launched by the Bodega Faustino in 1960. The Faustino group is today the biggest wineyard owner in Rioja with 760 hectares and stocks over 12 million bottles of Reservas and Gran Reservas in ist ageing cellars. 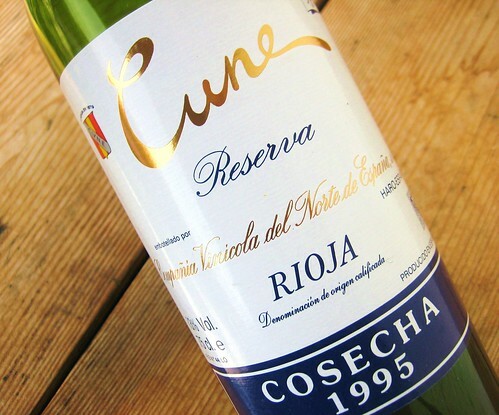 1987 was an above-average year in Rioja (82 points according to Mr Parker) but not truly exceptional. The wine was dark in colour but not with full clarity. The nose had a certain eucalyptus freshness and slight berry fruit. On the palate the wine didn’t appear very harmonious and balanced. Acidity, fruit and tannins didn’t come together quite well and drew a nervous picture of a wine which has overpassed ist drinking phase. This tasting was marked by the 2 oldest bottles in my opinion, and one could say it was a duell between the better vintage (1970 Campo Viejo) and the better name (Imperial), which in the end, we agreed has slightly been taken by the 1975 Imperial. Besides those 2 we were quite surprised by the Vina Berceo which had the most complexity of the 3 younger wines, maybe due to the fact it was the best vintage of all 5. Something that irritated us a little was a bitter-note that came through in all 5 bottles in a more or less intense way. We tried to come up with reasons for it and guessed that the sweet impression on the tip of the palate, either coming from the oak or being an intrinsic attribute of the tempranillo grape, made this final bitternote – whereever it stems from- much more apparent. We then concluded that, despite the fact that these wines were all exceptionnaly well drinkable and in good shape (no cork fault), they have surpassed their ideal maturity and might have offered greater pleasure some time ago. This wasn’t so obvious to tell for the 2 old Gran Reserva, but most evident for the Faustino which made a quite unbalanced and nervous impression. When compared to the old Burgundies and Bordeaux tastings we already had I would say that, for this time the Riojas couldn’t overtake them, but I’m pretty optimistic that it will happen at a further tasting. Thank you Oskar for the fine supply and see you soon for the next episode.